Lost in the Florida Everglades, suffering from extreme sunburn and drinking only what water she can filter through her underwear, Professor Brenda Johnson, the protagonist of The Cuban Affair, wonders who is after her and why. She is merely an academic, after all. But her secret project— a new method of desalinizing (removing the salt from) sea water — attracts international attention from an array of unsavory characters, and soon her experience in the Everglades seems like a walk in a neighborhood park compared to adventures that she faces later on. Johnson’s desalinization project puts her in direct conflict with Saudi Arabian nationals who wish to stop her research. Even though she is put under US military protection, her work also puts her in the orbit of student spies from Saudi Arabia and a corrupt ex-Army man who wants to drill for oil beneath the Everglades, not to mention Johnson’s ex-girlfriend, a popular candidate for the US senate who has dark secrets in her past. 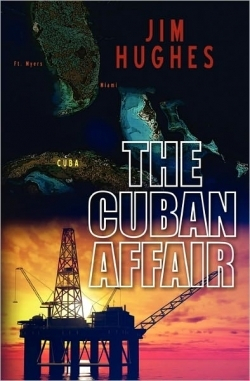 The Cuban Affair is the second book by Jim Hughes. His first novel, The Baja Project, was a finalist in the 2009 Indie Book Awards. Hughes has the chops and experience to write a solid, entertaining thriller. Hughes manages the disparate threads of his story with ease, jumping from one to the other clearly, without confusion for the reader. He moves his prose along with a light hand, never lingering too long over a scene or hammering home themes too obviously. The Cuban Affair goes down smoothly and rapidly, a joy to read. A thriller succeeds not just as a well-oiled plot machine, but as a novel capable of ratcheting up the tension, a task at which The Cuban Affair succeeds admirably. At first, Hughes hooks the reader’s curiosity as to how all the subplots will eventually conjoin. Then, as Johnson and other sympathetic characters become more deeply embroiled in danger, the reader begins to root for a happy ending. To Hughes’ credit, most of the characters are basically sketched, but done so with enough deftness so that one cares about the good guys and wishes for the bad guys to get their comeuppance. With alluring characters and plot twists that draw readers more deeply into the story, The Cuban Affair maintains suspense till the very last page. Overall, The Cuban Affair looks and reads like a high-quality, mass-market work. The occasional punctuation error or spelling mistake is noticeable, but these minor flaws do not detract from the fact that Hughes’ work is well written and engaging. As an excellent example of the suspense genre, The Cuban Affair will be consumed avidly by lovers of thrillers, high-octane mysteries and international intrigue.